R35's have run in World Challenge both as all wheel drive, and rear wheel drive, with not a lot of success. This year the GT3 spec car, depending on allowances should be able to be competitive. Already this year, a GT3 car won at the 12 Hours of Bathhurst. Lets see how the GT-R does against the diverse World Challenge field. 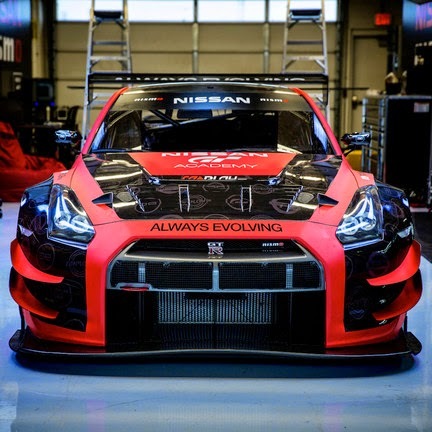 NASHVILLE, Tenn. – Nissan Motorsports announced today a partnership with Always Evolving (AE) to campaign two GT Academy-NISMO Nissan GT-R GT3 racing cars for the 2015 Pirelli World Challenge season. Nissan GT Academy North America 2011 winner Bryan Heitkotter will drive one of the team cars, while Australian open wheel and GT star James Davison will pilot the second car. Featuring logos from the GT Academy program, the two cars will be co-sponsored by Replay XD and NISMO. AE will utilize AIM Autosport for much of the car preparation and on-track support during the season. based in Los Angeles, the team was founded in March 2013 by friends Roger Rodas and Erik Davis as a platform combine their passion for cars and their desire to support their favorite charitable organizations. Following Rodas' tragic passing in November 2013, the team has established "Racing in Honor" as their internal mission for the 2014 season in his memory. ased in Los Angeles, the team was founded in March 2013 by friends Roger Rodas and Erik Davis as a platform combine their passion for cars and their desire to support their favorite charitable organizations. Following Rodas' tragic passing in November 2013, the team has established "Racing in Honor" as their internal mission for the 2014 season in his memory. AIM won the 2012 IMSA GTD team, driver and manufacturer championships, as well as the 2013 manufacturer title while campaigning a Ferrari. Based in Los Angeles, Always Evolving Racing was founded in 2013 by Erik Davis and Roger Rodas to combine the friends’ passion for cars with their desire to support their favorite charities. Following a tragic automobile accident late in 2013 that took Rodas’ life, Davis elected to continue with Always Evolving in his friend’s honor. Heitkotter, 34, won North America’s first gamer-to-racer GT Academy competition in 2011. In 2012 and 2013 while driving a Nissan 370Z NISMO for Doran Racing, Heitkotter earned three pole positions, two second qualifying spots, four top 10 finishes and a podium. In 2014, Bryan switched to a Nissan Altima for the CA Sports team. There, he earned three podiums and four top five finishes in the Pirelli World Challenge Touring Car (TC) category in six events. Most recently, behind the wheel of the Doran #41 370Z NISMO, Heitkotter and GT Academy teammate Nick McMillen finished sixth overall in the IMSA Continental Tire SportsCar Series (CTSCC) race at Daytona International Speedway in January 2015. Davison, 28, was born in Melbourne, Australia and moved to the United States when he was 18 years of age to develop his skills in open wheel racing. His career highlights include a 2005 victory in Formula BMW at Indianapolis Motor Speedway, a runner-up finish in the 2007 Star Mazda Championship, and second spot in the 2009 Indy Lights Championship. Davison ran up front during the 2014 Indianapolis 500 driving for Always Evolving KV Racing Technology, finishing the race in 16th position. In his limited time in sports cars he has always been at the front, driving for the TRG-Aston Martin team in IMSA competition. Davison has recorded five consecutive poles in IMSA including pole position at the 2015 Rolex 24 at Daytona International Speedway. In North America, Nissan's operations include automotive styling, engineering, consumer and corporate financing, sales and marketing, distribution and manufacturing. Nissan is dedicated to improving the environment under the Nissan Green Program and has been recognized as an ENERGY STAR® Partner of the Year in 2010, 2011, 2012 and 2013 by the U.S Environmental Protection Agency. More information on Nissan in North America and the complete line of Nissan and Infiniti vehicles can be found online atwww.NissanUSA.com and www.InfinitiUSA.com, or visit the Americas media sites NissanNews.com andInfinitiNews.com. Always Evolving is an integrated media and technology company with a diversified portfolio of software and hardware assets. The company recently acquired the Replay XD action camera system and is hard at work making sure more consumers, athletes and video producers love its cameras and video-based experiences. Based in San Francisco, California, Always Evolving's products and services are quickly becoming the only choice for action camera, drone and POV camera buyers and video producers everywhere. Established in 1995, AIM Autosport is a Canadian sports team operating multi-car teams in professional sportscar racing. AIM’s success has been achieved through the dedication of its employees and the continuous support of the team’s commercial and technical partners. Away from the track, AIM Autosport serves the needs of the racing community with a purpose-built preparation shop situated in the Toronto suburb of Woodbridge, Ontario.